Spread the word and get FREE BARRK! It’s simple… when you join & subscribe to BARRK, refer other rescues to the great features and time-saving solutions that BARRK offers. When those referrals subscribe & join, you receive FREE services. and/or its policies without notification. Referrals who sign up must purchase minimum of 6 months of BARRK. 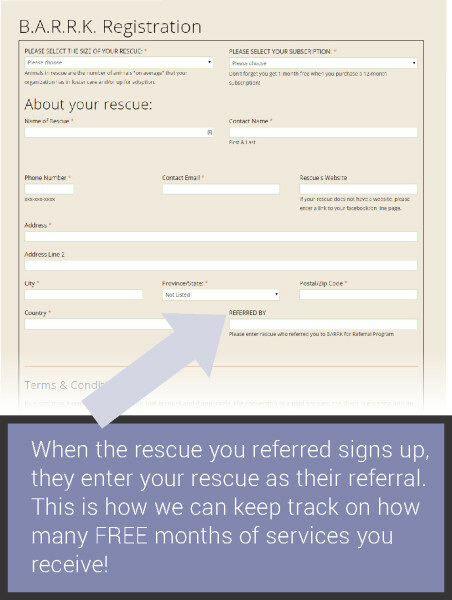 Your rescue’s name MUST be on their subscription form in order for you to receive your free services. Referral organizations must be non-profit animal rescues only. Background checks will be performed when we receive their subscription. Your subscription MUST be active and maintained for minimum of one year.